At least once a week, I try to make a fish dish, and since my wife and I both really like Halibut, it’s on the menu quite often. As such, I’m always looking for new ways to cook halibut, so I can keep it interesting. Fortunately, clean, light flavored fish (like halibut) go with a tremendous variety of foods, so it’s easy to change up the dish with the kinds of sides and other flavors you can bring to the plate. In this recipe video, I do a very simply seared halibut filet, and serve it over a vegetable succotash, that provides body, texture, and flavor. It’s easy to make, and you can do it in less than an hour. Hope you enjoy it! Cooking the fish properly is very important. Use high heat to make sure you get a good sear on both sides, and remember it won’t take long to cook. Overcooked halibut is dry, and tough, so better a bit under than a bit over. You want to just cook it through, which you can tell by making a small cut and testing the center; once it's opaque it's done. Hope you enjoy this halibut dish. It may seem a bit complex, but it's not that hard. 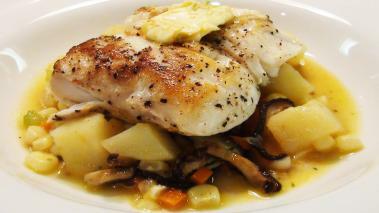 You can do the butter, mushrooms and potatoes ahead of time; and cooking the fish is very simple…so give it a try. Wine Recommendation: I like to serve this dish with a California Sauvignon Blanc. The wine typically has a good amount of acid, and goes great with food, and won’t over power the delicate halibut flavors. The floral notes in the wine will also help accentuate the citrus butter that tops the dish.